– Wooden walls, and wooden everything. It may be spring but hey, it isn’t too late to enjoy a little cabin in the middle of nowhere is it? Surely it is even better now – now that you can smell the flowers and lie in the grass without dying of pneumonia. I also want that piece of art so bad. – An abstract map of Paris. Feeding my desire to get back to Europe. At least maybe this will encourage to save more moolah. 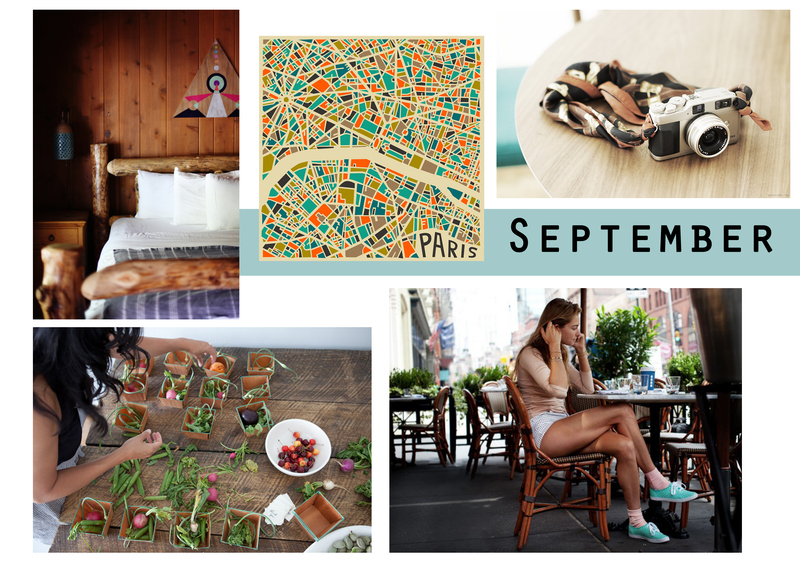 – Garance Dore spotted this camera. And what a beauty it is! I bet fashion lovers everywhere will now be attaching beautiful silk scarves to their gadgets. This has gotta be more comfy than a hard woven strap anyway. – Spring = salad time. No one likes eating salads when it’s cold, but now we want them everyday. And I love this idea for entertaining or a picnic. The cutest individual salad boxes. BRING ON THE PICNICS. – A pop of colour never goes astray. Simple outfits are the best when it’s warm, but I also hate wearing boring clothes. Somehow it seems to tamper with my mood and put a dampener on the whole day ahead. So maybe I just need to invest in some more colourful shoes and socks. Rock that with any outfit.